Compatible with macOS High Sierra. Slightly changed the color of the bookmark folders. Fixed a bug in the Font Handling (Edit menu -> Show Fonts). URL Manager Pro 4.4.5 adds a Yosemite (OS X 10.10) feature: a Share extension. With the Add Bookmark Share extension you can easily bookmark URLs that you encounter in other applications. I have written a small tutorial about the Share extension here. Please also note the new Share button in the toolbar (unfortunately not available on Yosemite) and the Full Screen tool in the top right of the window title bar (see screen shot above). Requirements : Snow Leopard or higher (OS X 10.6 or higher). Chrome fix and small bug fixes. Fixes a bug in the Spotlight importer and adds a 1024x1024 app icon. Support for Mountain Lion. URL Manager Pro 4.1.1 is compatible with Gatekeeper. This means that URL Manager Pro 4.1.1 has been signed with my Apple Developer ID and can be installed on Mountain Lion with the default configuration of Gatekeeper. The Mac App Store (MAS) URL Manager Pro 4.1 version is also compatible with Gatekeeper on Mountain Lion. Added the Save to Browser command for Safari. The new Service menu item also provides a good solution to bookmark in Firefox. This is the Intel version of URL Manager Pro. You can run it on Lion, Snow Leopard and Leopard. *Google Chrome is the new web browser from Google. Drag and drop of hypertext links from Firefox to URL Manager Pro. 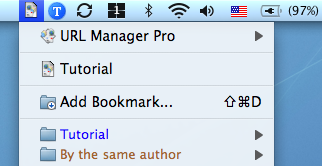 URL Manager Pro can now use the power of Spotlight to search your hard disk for words in your bookmark files. Enter the word you are searching for and Spotlight will list the bookmark files, if any, that contain these words. Click on one of the bookmark files found and URL Manager Pro will come to the front and the bookmark containing the search word will be selected. Use the menu command Find Again to find the next bookmark. Besides indexing, the URL Manager Pro Spotlight Importer plug-in will add some meta data to your bookmarks file. 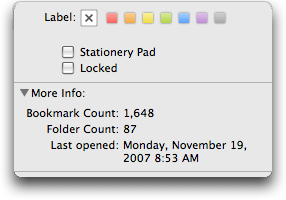 It will add a Bookmark and Folder count. Please have a look at the More Info section of the Get Info Window of a bookmark file in the Finder. As some URL Manager Pro users may remember, URL Manager Pro supported colored menu items in the bookmarks menu on Mac OS 8 and Mac OS 9. It reflected the label color the bookmark was given using the menu command Label from Bookmark menu. With the transition to Mac OS X this feature was lost. However, it is now back again starting from Mac OS X 10.3 and higher. You can see some colored bookmark menu items here: note the screen shot of the Bookmark Menu Extra in the Abstract below. You can enable the Auto-Tab folder attribute using the Get Info window on a folder of bookmarks. Selecting such a folder from a bookmark menu will open all the bookmarks of the folder in tabs in the current browser window. These folders can now be more easily recognized: they have a special icon in the URL Manager Pro bookmark window and in the Bookmark Menu Extra. The Add Bookmark Contextual Menu Item (CMI) plug-in is now a Universal Binary. Support was added for Apple Mail and DEVONagent. The Add Bookmark CMI plug-in is documented on a special web page. You can install it from the URLs preference pane in URL Manager Pro's Preferences. 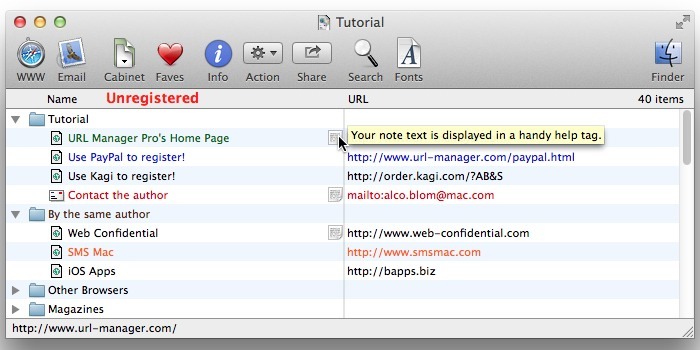 URL Manager Pro features a systemwide bookmark menu: the Bookmark Menu Extra (see below). With the Bookmark Menu Extra you have access to your bookmarks from within any application, including your web browser. The Bookmark Menu Extra is in the right part of your menu bar. With URL Manager Pro you save your bookmarks in bookmark files that you create and have full control over. You can create and manage several bookmark files and have easy access to them via the Cabinet feature of URL Manager Pro (see the Tour). I have a FAQ web page which can help you with some questions you might have. Please read it carefully. In particular, please note that your Cabinet and Startup Items folder should now be located in the Bookmarks folder in your Home directory. URL Manager Pro 4.1 is Intel native. Requirements: Mac OS X 10.5 or higher (i.e. Mountain Lion, Lion, Snow Leopard or Leopard). Previous release note: version 3.5.